The National Endowment for the Humanities is giving over $50,000 for a study on propaganda to a philosopher who thinks watching Fox News can brainwash liberals. The project, "Propaganda and Belief in the Modern World," is a book-length study on the "psychology of belief formation." Eric Mandelbaum, a "philosopher and cognitive scientist" at City University of New York, received fellowship funding in the NEH's latest round of grants under the Trump administration. Mandelbaum writes that "one can end up believing anything" in an article that concludes liberals can be brainwashed by watching Fox News. "How can human beings, seemingly the smartest animals ever encountered, be so freaking dumb?" Mandelbaum muses on his "about me" page of his website, which he calls, "Thoughts about thoughts." "We seem to acquire beliefs with the ease with which we catch colds, yet we also seem to learn nothing," he says. Mandelbaum coauthored a paper in 2015, entitled, "Believing without Reason, or: Why Liberals Shouldn't Watch Fox News." In his beginning section, "Believing Badly," Mandelbaum lists believing in God as one of several "odd beliefs" Americans hold. "[Seventy-four percent] of American adults believe in God, 72 [percent] believe in miracles, 68 [percent] believe in heaven, 57 [percent] believe in the Virgin birth," the article states. "Thus more Americans believe that Jesus was born of a virgin than that humans are part of the phylogenetic tree." "As of May 2014, 22-28 [percent] of Americans believe that the Bible is the actual word of God, and is to be taken literally word for word," Mandelbaum emphasizes. "People hold shockingly irrational beliefs," he writes. 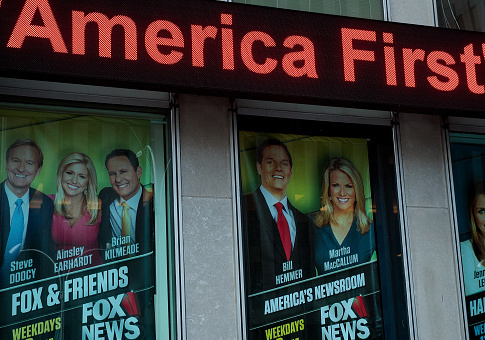 The thesis of the article—why liberals should stay away from Fox News—is that the crawl news feed at the bottom of the television screen can unconsciously influence viewers. "[I]f the evidence previously discussed is correct, then merely attending to some element of the scene (e.g., the crawl) while suppressing attention to the others will induce load and trigger an unconscious passive acceptance of whatever you read, whether or not you consider the source to be credible," Mandelbaum explains. "The reluctant liberal Fox News viewer, then, will not merely unwillingly accept information (e.g.,) embedded in the crawl, but will integrate that information with other previously held beliefs," he continues. "And this information—these new beliefs—will not only be acquired in an evidence-less fashion, but they will be acquired from sources the viewer explicitly rejects as trustworthy sources. These beliefs will then be integrated into the subject's future decisions and attitudes, unbeknownst to her and despite her better judgment. If the Spinozan model is correct, this proliferation of belief without evidence is real and serious." Mandelbaum adds that viewers are not safe, even if they tell themselves, "This report is not credible and I should reject it." "[O]nce parsed and understood, the report lies ‘sleeping' in central cognition, stretching its inferential tentacles outward," he writes. "When you combine brute-causal belief acquisition with the constant attentional and behavioral regulation that we engage in, one can end up believing anything," Mandelbaum concludes. NEH awards are signed off on by the chairman, which currently is Jon Peede, a Trump administration appointee. Trump proposed eliminating both the NEH and National Endowment for the Arts in his budget. "In its latest funding cycle, NEH awarded 253 grants to support humanities projects across the nation, including a book on John Locke’s influence on American political thought, digital educational materials on the ratification of the U.S. Constitution, a website on New Deal art in New Mexico, a scholarly study written by a U.S. Navy Reservist and combat veteran on how military troops are depicted in eighteenth- and nineteenth-century literature, and numerous conservation projects to protect the history of Jewish culture in the South, the personal library of author C. S. Lewis, and irreplaceable records of the nation’s maritime history," the Office of Communications at NEH said in a statement. Request for comment from Mandelbaum was not immediately returned. He received $50,400 from the NEH for the fellowship on propaganda and belief. "I just won an NEH Fellowship," he wrote on his website on Dec. 13. "So that's pretty cool."